The ‘one rein’ method of suppling, slowing, or correcting is often mistaken for a derivative of Baucherism. But it’s not. And it should be avoided if you’re pursuing high school. The comparably slight – and progressively subtle – lateral flexions of Baucherism exist temporarily (1 – 5 sessions at most), and are merely the baby steps used to introduce the direct jaw flexion, a cornerstone of the Baucherist program. We may occasionally review the lateral flexion, but tactfully, and at ten or twenty degrees in pursuit of increased fidelity – not “to the boot” at 180 degrees, and not unceasingly in pursuit of more “respect”. Thanks mostly to a certain Australian’s popularization, the “one rein stop” has become something shy of an entire methodology unto itself. The CA/DU audience is comprised primarily of novice horse owners and lovers, and, of course, their safety should be a first concern. But if safety is really our concern, a) we might start novices on horses who are actually trained, and b) there is a far better way to shut down the bully quadruped. The logic behind the one-rein stop seems sensible enough in isolation. It’s sensible to ensure a young horse is trained to flexion laterally in response to either the bosal or the snaffle so that, should things get out of control (and in the novice rider : novice horse scenario, they will), the horse is obligated to respond when we enlist physics to slow things down – ideally to a pointless circle, whereupon the horse will realize he may as well stop. I have no problem with this basic logic as a precautionary measure and an insurance policy. But problems arise when full lateral flexions are used habitually as a daily suppling routine, and for speed correction, because its ’emergency stop’ effect is actually quite unreliable, and the horse’s eventual anticipation of it is destructive to balanced movement and straightness, handicapping academic progression. The one-rein effect is popular because it is easy to understand. It’s simple to teach novices (because it requires no ‘feel’), and is easy to use – so easy, in fact, it quickly becomes reflexive. As typically practiced by those who learn it at their first colt-starting clinic or ‘introductory DVD’, the utility of a routinized ‘one-rein’ flexion (unlike the preliminary flexions of the Baucherist school) is as a punitive reminder of “who’s in charge”. But this appeal to authority – outside the context of a real emergency – isn’t something we need to revisit every ride – nor, really, ever, beyond the initial phases of basic saddle training. The one-rein fall-back skirts and masks a fundamental training gap, one best resolved well before mounting up: the acceptance of direct, even contact*. In essence, it simply skips the lesson of the hand altogether. *Note: ‘Contact’ is another important topic, but understand for now that by ‘contact’ I do not at all mean to imply ‘traction’. I mean merely enough tension – however delicate – to effect a functional, open line of communication via both reins at once, which can exist on only weight of the reins. 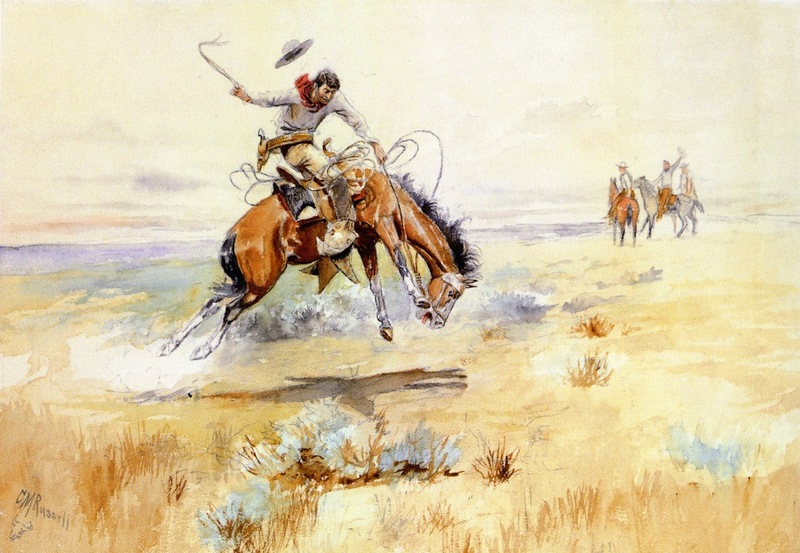 The one-rein technique is essentially a remnant of “pulling” – a buckaroo means of teaching the horse respect for the hackamore via ‘doubling’ or doblar. How? From the ground, we simply encourage the horse run headlong into the physics of the hackamore a couple of times. If you’ve ever seen an excited guard dog hit the end of his chain, you get the idea, except in the case of the horse we use the rope attached to the bosal (the mecate) to effect the sudden stop. With enough excitement, the dog will literally spin around when reaches the end of the chain – and so will a horse. At this point he has been ‘doubled’. Natural Dogmanship. You can read all about doubling by picking up a copy of Ed Connell’s books on vaquero magic. Or you can take my word for it. Either way, hopefully you arrive at this conclusion: even in the Californio context, the objective is to obviate the need for full lateral flexions as soon as possible – not embed them as a routine. As Mr. Connell explains, during the bygone days of the Californio, the one-rein (and a range of other indelicate techniques) had somewhat more reason for being. Horsemen of this era had a very limited amount of time to break numerous rank, virtually ferrel un-handled horses who had grown up on the range. It was a very different class of students compared to the majority of today’s subjects, who’ve been raised, more or less, as pets, and who, well used to human contact and management, generally offer very little – if any – resistance to backing and basic training (presuming a modicum of tact and patience). Applying an unnecessarily authoritarian, bronc-busting attitude to horses who are confused (not belligerent) may make you seem confident to neophytes who know even less, and may temporarily purchase what appears to be ‘respect’. But hear me: you will never reach high school treating the horse as a bovine (or as a dog). You sacrifice to false gods. If it feels a little wrong when you do it, congratulate yourself for having a thing we call empathy, and follow it. With the Baucherist program, once the horse knows to respond and deliver a full lateral flexion, we’re done with full lateral flexions. In the interest of balance and straightness, we simply won’t use it anymore. Why not? a) We want to avoid its unintended effects – namely, the horse’s chronic anticipation of having his face pulled or ‘snatched’ suddenly left or right, which sacrifices fidelity to a false sense of control, disconnects his front end from his back end, and inevitably cause him to over-bend – and yet under-steer, displacing his hindquarters outside (which he effectively must do to avoid toppling over – indeed, this is how stunt riders make horse “fall over” at a gallop in the movies). b) With Baucherism, we don’t need it. We have recourse to a far more reliable – and academically constructive – emergency brake: the ‘combined effect’ – a.k.a. Francois Baucher’s effet d’ensemble. The one reign stop is a particularly problematic brake pedal for a couple of reasons. Balance. Prevailing equilibrium and balance is what we’re trying to develop – we never want to intentionally throw the horse off balance, which is the modus operandi of the one-rein stop. Far worse than simply throwing him off balance, frequent use of sharp, lateral pulling will encourage him to take on a new, problematic, erroneous balance – one which, however, enables him to more easily keep moving in the direction he’s already going in the event of a sudden, firm pull left or right. By doing this repeatedly, we are inadvertently teaching him to disconnect his neck from his body, and to follow his shoulders, rather than his nose. Straightness. Secondly, he will quickly get use to going one direction or the other (versus remaining rigorously straight) in the course of halting, because in the experience you’re providing, he must end up doing so virtually every time. Moreover, the instinctive shift he makes left or right, he will tend to make on his shoulders, throwing his haunches to the outside the circle and disengaging them, versus using them for impulsion out of the turn. In frustration, you may begin to kick him with your outside leg in a belated attempt to remedy this bad habit, but the disconnection you’ve instilled at the base of the neck greatly mitigates this recourse, translating to a confusing punishment every time you turn. Impulsion. “Impulsion” may have little meaning for you yet, but if equitation is something you plan to stay with for the rest of your life (and you may as well), you will come to know it and learn to control it. Impulsion can be tricky to understand initially, but think of it as the energy and cadence of a magnetic desk toy. It is ultimately the horse’s tendency and easy willingness to continue expending a steady amount of energy, whether invested in forward progress (pushing forward), or concentrated collection (lifting his mass upward). It is notoriously difficult to maintain, and must be ruthlessly safeguarded. For now, just understand that 1 and 2 above are both destructive to it. Reliability. Though often promoted as a reliable failsafe “because the horse is weaker to the side than straight ahead”, I must tell you it is not. At all. Yes, horses may be a bit weaker laterally if it ever comes to a contest of strength between them and their teacher (you) – which it shouldn’t beyond very basic training. A mature horse committed to taking the rest of the day off can easily sling most riders right out of the saddle. He may be weaker laterally, but he’s still orders of magnitude stronger than you in a real contest. Do not take to the field on a green horse presuming the one-rein will save you from a wreck. Full lateral flexions are an entirely unnecessary means of routine “suppling” – though in rare instances, for a few horses, the flexion can help mitigate certain muscle/nerve “blockages” along spinal column if they exist. In the vast majority of cases, however, you will find your horse to be much like mine: he can already scratch his hip with his teeth (which more that you can say, or so we shall politely presume), without any forced calisthenics from a mere biped. Using the ‘thinking side’ of the human brain (which better be both sides in my case, or I want half my money back), we can pretty quickly install the best emergency brake there is, while also progressing our fidelity, and our horse’s education. Like all of the best solutions, it’s based on psychology, versus brute strength or physics. Stay tuned for more on the Effet d’Ensemble or ‘combined effect’.